Below you will find CRA’s event schedules for 2018! We offer Christ...Redeemer...Anointed One Conferences. To read about this exciting ministry opportunity you may click here to go directly to that page or click on the CRA Ministry Engagements button in menu bar. ISRAEL & GREECE...Trip of a Lifetime! THIS YEAR'S TRIP IS CLOSED! CHECK BACK FOR COVERAGE OF OUR JOURNEY! PLAN TO JOIN US ON OUR NEXT TRIP.....???? 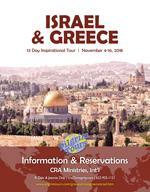 Please join us for a ...Trip of a Lifetime to Israel & Greece! As we begin our journey together, we will spend 3 incredible days in ATHENS, GREECE...then onto ISRAEL! While in Greece we will visit the place where the Apostle Paul walked and taught. Walking through the Acropolis, the Parthenon, before viewing Athens atop Mars Hill, it will leave a person breathless! Then as we visit Israel, we will experience walking where Jesus walked, teaching and learning where Jesus taught. Be in the very location where miracles occurred BUT the great news is "Jesus is the same yesterday, today and forever". He is still in the miracle business and we believe that a miracle is awating you!!! We will visit Caesarea, Mt. Carmel, Megiddo, Nazareth, Sea of Galille, Capernaum, Jordon River Baptism, Northern Galilee, Beit Shean, Gideon's Spring, Bethlehem, Jerusalem, Masada, Ein Gedi, Qumran, and then back to Jerusalem visiting the Garden of Gethsemane, Upper Room, and many more sights. It will be a Journey of a Lifetime that you will never forget. Space is limited...we will only be taking one bus, (40 passengers) so contact the CRA Ministries office today and get your seat reserved!!!! This Isreal/Greece Journey is being offered at a very affordable price and we will be flying El Al Airlines (The Isreli Airline) which has been noted tobe the 'safest' airline in the world. or CLICK HERE to download brochure! Click on the link below to see all the details and printable PDF forms!